Extended Unemployment Benefits On Track To Expire Dec. 28 : The Two-Way A congressional vote to renew extended unemployment benefits may have to wait until the new year. Senate Majority Leader Harry Reid will push for it in January if a last-minute extension fails to come together. 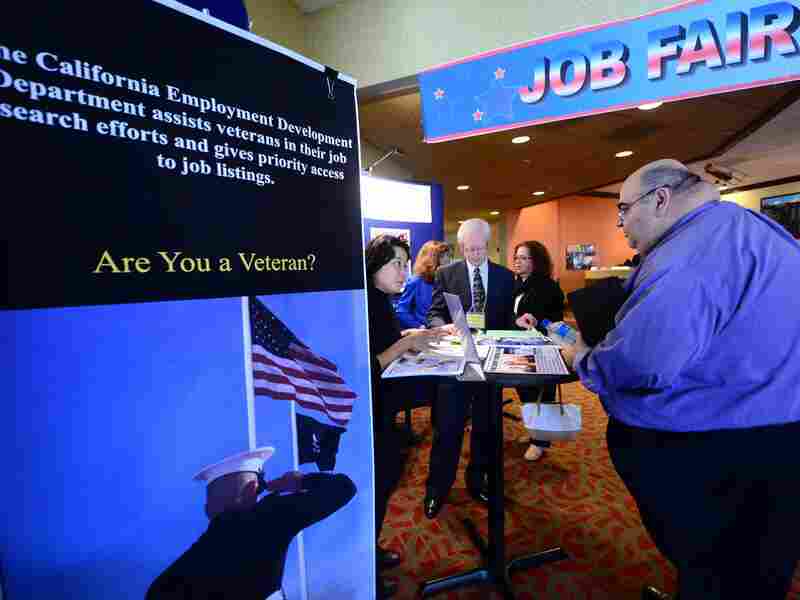 A prospective job seeker gets information at a job resource fair for military veterans in Van Nuys, Calif., on Oct. 24. Unless Congress acts very quickly, some 1.3 million workers will lose their extended jobless benefits on Dec. 28. Democrats were scrambling late Wednesday to link an extension of benefits to a budget deal that is expected to get a vote as soon as Thursday. But if the effort fails, they will come back at it in 2014. "We're going to push here after the first of the year for an extension of emergency unemployment insurance when the Senate convenes after the new year," Senate Majority Leader Harry Reid, D-Nev., said on Wednesday. And House Speaker John Boehner, R-Ohio, did not slam the door shut on the possibility of renewing the jobless benefits eventually. When asked whether he would consider allowing an extension of the funding, he said he told President Obama he would keep such a plan on the table. "I said we would clearly consider it, as long as it was paid for and as long as there are other efforts that will help get our economy going once again. I have not seen a plan from the White House that meets those standards," he said. The White House, along with Democratic leaders, had hoped to extend the benefits before they expired this year. But those plans seemed to diminish on Tuesday, when Sen. Patty Murray, D-Wash., and Rep. Paul Ryan, R-Wis., unveiled their bipartisan budget deal that did not include any last-minute reprieves for the federal Emergency Unemployment Compensation program. Because the House plans to leave on Friday, the vote on the budget package is expected very soon. Reid said the deal should have included an extension of jobless benefits, but "neither side got everything it wanted in these negotiations." The White House had wanted the benefits included in the budget, saying that besides the 1.3 million people who will lose their benefits on Dec. 28, an additional 3.6 million people will fall out of the unemployment insurance program in the first half of the year without an extension. Democrats, along with a few Republicans, want to have a chance to renew the jobless benefits. "For goodness sakes, let the people's House have a vote on these issues," Rep. Chris Van Hollen, D-Md., said Wednesday on MSNBC. "Let us have a vote right now on extending unemployment compensation." A group of moderate House Republicans sent a letter to their leaders saying: "We respectfully request that the House consider a temporary extension of emergency unemployment insurance to protect an essential safeguard that has aided Americans who have endured through a weak economy." It was signed by Rep. Chris Gibson, R-N.Y., and six other Republicans. The benefits extension program was a key element of the government's response to the recession, which sent the unemployment rate up to 10 percent in 2009. Congress poured in money to keep benefits available for up to 99 weeks — far longer than the typical 26 weeks provided by states. Most economists said those checks would help prop up the economy by providing unemployed people with about $300 a week to keep up with the cost of food, shelter and gas. But in the past couple of years, the unemployment rate has been coming back down and federal extended benefits have been reduced to a maximum of 47 weeks. The jobless rate is 7 percent now, and many conservatives say the extra spending is actually discouraging many people from trying harder to get back into the workforce. They say the economy will strengthen when government cuts spending and workers make the necessary adjustments to find new jobs, such as moving or accepting lower wages. The Congressional Budget Office estimates that continuing benefits for another full year would cost taxpayers about $26 billion — but it also would boost economic growth by about 200,000 jobs. NPR congressional correspondent Tamara Keith reports that the House Rules Committee did not link an extension of unemployment benefits to the budget deal scheduled for a Thursday vote.